One of Locarno’s major attractions is the beautiful church of Madonna del Sasso, which sits majestically, if somewhat precariously, on a rocky crag overlooking the town and lake below. “Sasso” means “rock” in Italian. The church was consecrated here in 1487 at precisely the same spot where Bartolomeo d’Ivrea, a monk from the San Francesco Monastery in Locarno, had witnessed a vision of the Virgin Mary 7 years earlier in August 1480. Over the centuries it has become an important pilgrimage church and a place of sanctuary. 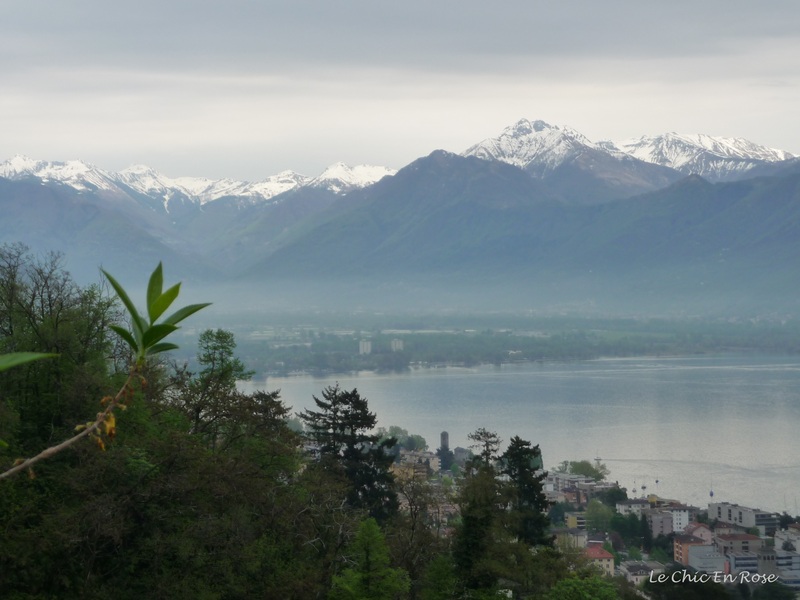 The adjacent lookout point also affords a spectacular panoramic vista over Locarno and Lake Maggiore and views across to the snow covered peaks of the Lepontine alpine range. There are a couple of options for getting up to the church, which is situated near the hillside suburb of Orselina. One is to make the ascent by foot, up the steep and wooded ravine, that leads up the mountain from Locarno – this takes about 20 minutes. However we opted to take the Locarno-Madonna del Sasso Funicular (FLMS in its Italian abbreviated form), which is obviously a lot quicker! You alight at Madonna del Sasso station and come to the panoramic viewing point before walking down some steps to the church itself. We didn’t have the best day for taking photos but the views were still impressive. They would have been magnificent on a clear sunny day! We walked around the grounds of the church but opted not to go round. The sanctuary is open to the public on a daily basis and you can find out further details here. Locarno-Madonna Funicular – trains about to cross! The pilgrimage church of Madonna del Sasso perched on a rocky crag above Locarno! The final stop on the funicular is just a little further up the hill at Orselina. Here you can switch to the Cardada Cable Car and from Cardada Station a chair lift, which takes you to the summit of Cimetta mountain. At 1671 metres above sea level, Cimetta offers skiing and other winter sporting activities and is also a favoured destination for summer hikers. Since it wasn’t the best day for panoramic viewing, we didn’t make the ascent to the top but if you are interested there is more information here though you’ll need to be able to read Italian as I couldn’t find a link in English! Lake Maggiore is a hauntingly beautiful place and I never tired of taking photos – some of the most idyllic moments were as dusk was falling. Next week we’re heading off to a beautiful island in the middle of the lake, home to some of the most gorgeous botanical gardens we had ever seen. The island also has a rather risque past – definitely a change of scene from Madonna del Sasso! Caio for now! I wonder if the priest has difficulty holding peoples’ attention during the service? Yes I’m not sure how many services they hold here but it would be difficult if people were trying to peer down at the view! There is a sanctuary here so I think people go there for spiritual retreats – it is certainly very peaceful up in the mountains! Thank you ! We had a wonderful 15°C yesterday, it was amazing ! Definitely a church with a view Rosemary – and what a view!! Just wonderful – there’s something about snowy mountains isn’t there? I know you said you didn’t have the best weather for pictures but I think they’re wonderful – very atmospheric! I cant wait to see some of the many pictures from the island trip and gardens this week. I feel like I am there as well, and I enjoy getting to know these places, as I had no idea they excised. What a spot! This last three photos are stunning! Thanks Kerry 🙂 Am glad you love the photos too – those ones of dusk were some of my special favourites the light and colours across the lake and mountains were amazing! I think that you said it best ‘Lake Maggiore is a hauntingly beautiful place’. Your photos are AMAZING! It is wonderful to live vicariously through your talented eye!